M2 Studio conducts seminars, trainings & workshops from topics ranging from photography, videography / editing to art & design. Quality education at competitive prices. Custom tailor on-location workshops for private, corporate and organizational requirements are also available upon request. Contact us today for more details. NOTICE: ALL WORKSHOP BOOKINGS ARE TO BE DONE ONLY VIA OUR ONLINE RESERVATION FORM ON THE EVENT PAGE TO ENSURE PROPER REGISTRATION. INQUIRIES CAN BE CONDUCTED VIA PHONE OR EMAIL. 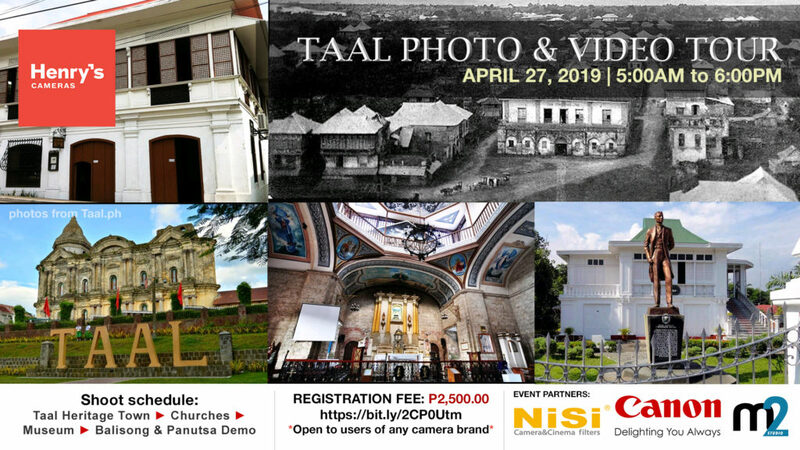 Objective: To promote photography and videography to the community through an organized tour to Taal town’s Iconic churches, museums, cultural sites and communities. Learn: Do’s / Dont’s, experience Taal town first-hand, documentation of churches & culturally important locales. Requirements: OPEN TO USERS OF ANY CAMERA BRAND & no shooting experience required, comfortable shooting clothes, tripod/monopod is optional. *Schedules are subject to change without prior notice.Check on the active events list for updated information. All workshops are on FIRST COME, FIRST SERVED BASIS ONLY. For paid workshops, payment must be made to confirm your reservation. For free workshops, we will approve the registrations in the order that they came in. Kindly follow the payment instructions at the event page. We believe that not all instructors and programs are built the same. That’s why we are staffed by experienced & trained industry practitioners who have also taught at the premier academic institutions in Metro Manila, Philippines. Our curriculum has been formulated to open the eyes of our participants by combining the information learned in the classroom with actual experience on the field. For more information, please contact us at (02) 209-8300 or email us to find out about our current workshop offerings or if you want us to customize a workshop for your group’s needs.